Sharp, tangy celery swirls up with ultra-refreshing cucumber and leafy greens to create this gem of a light, lively juice. Ingredients: ORGANIC CELERY JUICE, ORGANIC CUCUMBER JUICE, ORGANIC SPINACH JUICE, ORGANIC ROMAINE LETTUCE JUICE, ORGANIC KALE JUICE, ORGANIC LEMON JUICE, ORGANIC PARSLEY JUICE. Shake away separation. Drink up invigoration. Cold-Pressed using High Pressure Processing. Spinach grows like grass, so it’s often cut with large mowers. Baby spinach is sweet and tender. 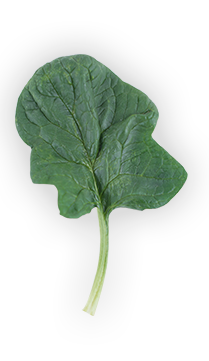 Teenage spinach is larger, tougher and slightly less sweet. Adult spinach is even tougher and bitterer, and ideal for sautéing.